We pride ourselves on providing quality Antique Fairs within Carmarthenshire. You can find an extensive array of Welsh oak furniture, country pine, books, jewellery, Welsh pottery and textiles, militaria, art pottery, fine French clocks, Welsh art, Persian carpets and much much more. The introduction of an open-air Vintage market to include 20 marquees last year, has proved a popular addition to the 60+ inside stands, at the National Botanic Garden Fair. For all fairs: catering services available with ample FREE car parking and a relaxed and friendly atmosphere. For all fairs: catering services available, ample FREE car parking and the atmosphere is relaxed and friendly. This fair has doubled in size and there will be 50+ stands. Admission is £5.00 and includes entry to both the gardens and the fair. 10.00am ‘til 4.00pm all events. 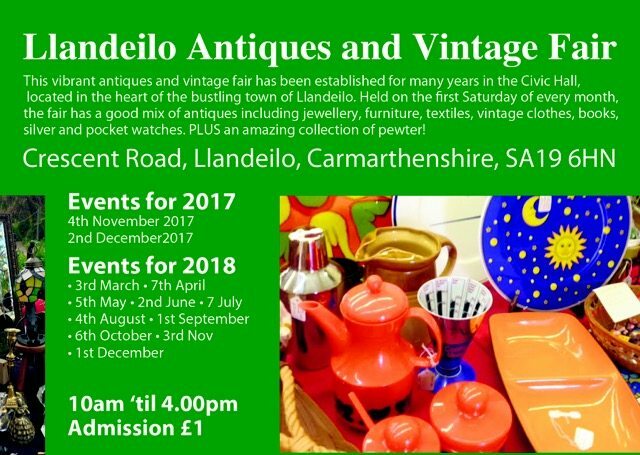 This vibrant antiques and vintage fair has been established for many years in the Civic Hall, located in the heart of the bustling town of Llandeilo. 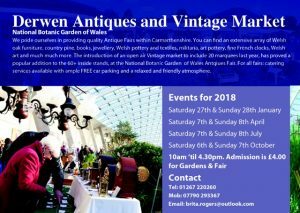 Held on the first Saturday of every month, the fair has a good mix of antiques including jewellery, furniture, textiles, vintage clothes, books, silver and pocket watches. PLUS an amazing collection of pewter!